But over the past couple of years, “Trolley Nights” on South Main have lost a lot of their glamor. That’s because in 2014, the city mothballed its fleet of old wooden electric trollies after two of them caught on fire. Seriously. The old trollies actually went up in flames. Talk about a hot seat! Fortunately, no passengers were injured, but the old downtown trolley fleet was shut down as experts from the American Public Transportation Association were brought in (presumably by taxis) to conduct an investigation. After a thorough inspection and review, the experts reported the explanation for the firey trollies was simple: There had been virtually no maintenance on any of the trollies in the fleet. We were just letting these charming old trolley cars creep along until a couple of them burst into flames. The beautiful old trollies were replaced by the aforementioned “trolley buses.” It was like replacing the Beale Street Flippers with a couple of dogs who could stand on their hind legs, if you hold their front legs up. I loved the old trollies, and I’ve missed them greatly over the past couple of years. I’ll be the first to admit that the old Memphis trollies did not actually constitute a mass transit system like light rail transit in other cities and the Garden District trollies in New Orleans. 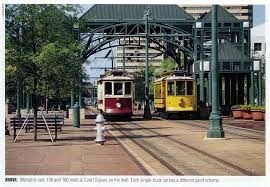 The Memphis trollies were more like the cable cars in San Francisco. They were mostly just a nice ride for tourists. But I enjoyed those rides on the old uncomfortable wooden chairs, as my wife and I would head down South Main on a Friday night. But I have some good news to report. The streetcars we desire are coming back, most likely by the end of the year. Last week the Memphis Area Transit Authority announced that they expect the refurbished electric trollies to be running along Main Street again in the next several months. And here’s even better news. They do not expect any of them to catch on fire. I can’t wait to take my seat again. But for safety’s sake, I may bring along my own fire extinguisher. make money online: Your blogs additional more each and every else volume is so entertaining further serviceable It appoints me befall retreat encore. I will make money online immediately get your RSS feed to remain informed of any updates. Dissertation Writer: Our marketing is good for health we should take every thing serious but we should be like a amazing and things to do in proper ways. fly gps pokemon go: I definitely enjoyed every bit of it and I have you bookmarked to see new information on your blog.